Recipe from Radhika Saveri, Marketing Manager, Stouffer’s Lean Cuisine. 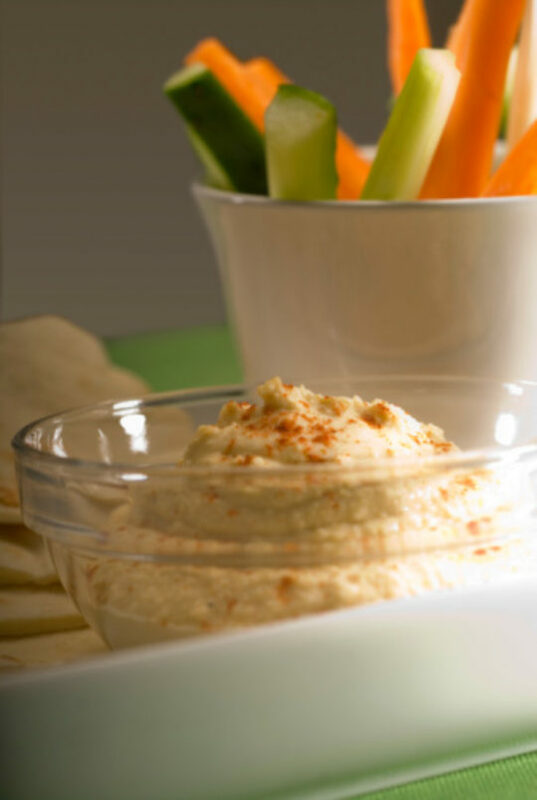 Hummus has become a very popular dip – it is low in fat, vegetarian and full of protein. Try it with variations, or the traditional way on a toasted pita wedge, baked tortilla or your favorite whole-grain cracker. It’s also a delicious and healthy alternative to mayonnaise on a burger! Place the cooked chickpeas (it’s OK if they’re still warm) in the food processor along with the garlic, lemon juice and water. Process for about a minute, until smooth. If too thick, add more water. Stir in the tahini and spices. Spread the hummus into a shallow bowl, drizzle with olive oil and garnish with lemon slices and minced parsley. Serve chilled, with warm pita bread and/or fresh vegetables. Hummus is also high in magnesium, potassium, phosphorous and folate!